The book consists of fifteen chapters and covers vast intellectual territory, from statistical thermodynamics to molecular medicine. Its foreword has been written by Prof. Richard L. Moss, the eminent cardiologist from Wisconsin who is a coninventor with Ariel Fernandez in a recent patent to treat heart failure. All in all, the book may place Ariel Fernandez at the center of a veritable biotechnological transformation. The book deals with a largely overlooked area of molecular biophysics that is likely to have strong impact on molecularly targeted medicine and drug design:the aqueous interface of a soluble protein. Foundational knowledge is presented in the first 7 chapters and enables the reader to effectively tackle major problems in biophysics, such as the protein folding problem and the therapeutic disruption of protein-protein associations. These advances have been heralded by others, as is evident, for example, in this review published in Scientific American. The remaining 8 chapters deal with medical applications mostly centered on rational drug design guided by the interfacial patterns of the protein targets. Some of these advances involve reworking anticancer drugs to make them safer and less toxic and to control their specificity, all of which are reviewed in great detail. This novel type of design was enthusiastically received by eminent physician scientists such as Thomas Force (Vanderbilt University) and was also covered in very promising terms for example in this review by Harvard oncologist George Demetri. Quoting Dr. Demetri: “The first generation of kinase-inhibitory drugs such as imatinib and sunitinib have already provided patients with life-saving therapeutic options, and with tools such as those described by Fernández et al., the future certainly looks bright for constructing ever-better agents that can be combined safely and effectively to manage, and eventually cure, many forms of human cancer”. 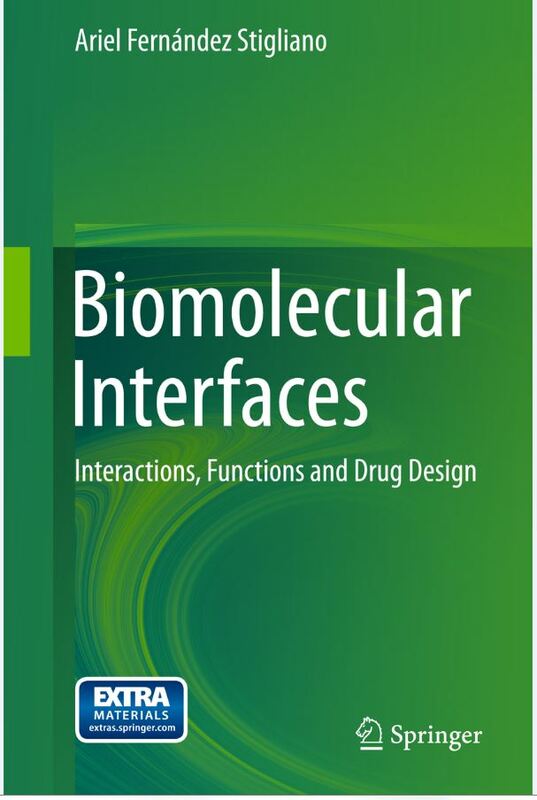 These seminal advances are further enriched in the book with a description of novel molecular design concepts that enable us to therapeutically disrupt protein-protein interfaces. This problem is considered to be a holy grail of molecular targeted therapy. Therapeutic opportunities stem from the advances described in the book. One illustration is provided in the potential treatment of heart failure by disrupting a myosin association with a myosin-regulatory protein, an invention with a pending patent by this reviewer (Richard Moss) and the author of the book. All in all, the book reports considerable conceptual novelty rooted in fundamental knowledge that needs to find its way into the pharmaceutical discovery and development pipeline, in particular in the hit-to-lead and lead optimization phases. Paraphrasing George Demetri, we conclude that the approach by Fernández and coworkers holds great promise for customized development of rationally designed therapeutic agents. breakthroughs in the realm of molecular biophysics are sorely needed. demanding and requires a multidisciplinary approach. folding, enzyme catalysis, protein associations, and drug/ligand design. in despair at their ungainliness. the challenges that have proven unyielding to research efforts. hydration patterns that serve as blueprints for epistructure-based drug design. selectivity filter for drug design based on the concepts introduced in Chap. 6. First and foremost, this book addresses an issue that is very important in protein research, namely, the interactions between a protein molecule and its surrounding water environment. This very complicated relationship is often simplified or ignored in molecular modeling. Such an ill-considered strategy simplifies the model but leads to unrealistic predictions of molecular behaviour. By contrast, this book introduces the reader to Epistructural Biology, a model that covers various important aspects of the protein-water interaction. The model is explained with an articulate clear writing style and backed up with enough mathematics to put the ideas on a firm theoretical foundation. The book is suitable for advanced undergraduate and graduate students. To help the student assimilate the ideas, the chapters include several problems with solutions. This is an excellent introduction for students wanting to get a start in Epistructural Biology. President, AF Innovation, SRL, a Pharmaceutical Consultancy (2010-). Ph. D. Yale University, 1984 (fastest awarded Yale Ph. D.). Ariel Fernández introduced what appears to be the correct formulation for self-organization in nonequilibrium thermodynamics by realizing that the thermodynamically relevant degrees of freedom must belong to a center manifold, an algebraically closed entity, and not to an attractor, as Ilya Prigogine previously assumed. He has provided a semiempirical solution to the protein folding problem by introducing the episteric tension, a measure of the distortion of the water structural matrix that requires a multi-scale theory of dielectrics. He rationally discovered a ligand that would competitively disrupt a protein-protein interface for therapeutic purposes (patent pending). He also managed to predict and control induced folding in drug-target associations. Together with Ridgway Scott, he introduced the dehydron, a structural defect in proteins that promotes its own dehydration. A dehydron is a meta-structural feature of relevance in drug design, enzyme catalysis and protein folding. Ariel Fernández determined and measured the dehydronic field, the mechanical equivalent of the dehydration propensity of a dehydron exerted on a test nonpolar molecule and orthogonal to the Coulombic field. His current efforts are devoted to show that dehydrons are endowed with a catalytic role as enablers and stimulators of enzymatic activity. Ariel Fernández, Jozsef Kardos, Ridgway Scott, Yuji Goto and R. Stephen Berry: “Structural defects and the diagnosis of amyloidogenic propensity”, Proceedings of the National Academy of Sciences, USA 100, 6446-6451 (2003). Ariel Fernández, L. Ridgway Scott and R. Stephen Berry: “The nonconserved wrapping of conserved folds reveals a trend towards increasing connectivity in proteomic networks”. Proceedings of the National Academy of Sciences, USA 101, 2823-2827 (2004). Florin Despa, Ariel Fernández and R. Stephen Berry: “Dielectric modulation of biological water”. Physical Review Letters 93, 228104 (4 pages) (2004). Featured in Nature (News and Views) 432, 688 (2004). Ariel Fernández: “Incomplete protein packing as a selectivity filter in drug design”. Structure 13, 1829-1836 (2005). Jianping Chen, Xi Zhang and Ariel Fernández: “Molecular basis for specificity in the druggable kinome: sequence-based analysis”. Bioinformatics 23, 563-572 (2007). Ariel Fernández et al. : “Rational Drug Redesign to overcome drug resistance in cancer therapy: Imatinib moving target”. Cancer Research 67, 4028-4033, Priority Report, Cover featured (2007). Ariel Fernández, et al. : “An anticancer C-kit kinase inhibitor is re-engineered to make it more active and less cardiotoxic”. Journal of Clinical Investigation 117, 4044-4054 (2007). (featured in Press Releases). Commentary by George Demetri: Structural reengineering of imatinib to decrease cardiac risk in cancer therapy. Journal of Clinical Investigation 117, 3650-3653 (2007). Ariel Fernández: “Molecular basis for evolving self-dissimilarity in the yeast protein interaction network”. PLoS Computational Biology 3, e226 (2007). Ariel Fernández, Xi Zhang and Jianping Chen: “Folding and wrapping soluble proteins: Exploring the molecular basis of cooperativity and aggregation”. Progress in Molecular Biology and Translational Science 83, 53-88 (2008). Xi Zhang, Alejandro Crespo and Ariel Fernández: “Turning promiscuous kinase inhibitors into safer drugs”. Trends in Biotechnology 26, 295-301 (2008). Ariel Fernández and Alejandro Crespo: “Protein wrapping: a marker for association, aggregation and molecular targeted therapy”. Chemical Society Reviews (Royal Society of Chemistry, UK) 37, 2373-2382, Tutorial Review (2008). Ariel Fernández and R. Stephen Berry: “Golden rule for buttressing vulnerable soluble proteins”. Journal of Proteome Research (ACS) 9, 2643-2648 (2010). Larisa Cybulski, Mariana Martin, Maria Mansilla, Ariel Fernández and Diego de Mendoza: “Membrane Thickness Cue for Cold Sensing in a Bacterium”. Current Biology 20, 1539-1544 (2010). Editorially commissioned review by Kumaran Ramamurthi, Current Biology 20, R707-R709 (2010). Research Highlight in Nature Reviews/Microbiology: Lucie Wootton: “Bacillus takes the temperature”. Nature Reviews/Microbiology 8, 680 (2010). Ariel Fernández: “Nanoscale Thermodynamics of Biological Interfacial Tension”, Proceedings of The Royal Society A 467, 559-568 (2010). Ariel Fernández: “Variational mechanics of water at biological interfaces”. Fast Track Communication. Journal of Physics A: Math. Theor. 44, 292001 (2011). Ariel Fernández, Christopher Fraser and L. Ridgway Scott: “Purposely engineered drug-target mismatches for entropy-based drug optimization”. Trends in Biotechnology 30, 1-7 (2012). Ariel Fernández: “Communication: Epistructural thermodynamics of soluble proteins”. Journal of Chemical Physics 136, 091101 (2012). Ariel Fernández: “Comunication: Nanoscale electrostatic theory of epistructural fields at the protein-water interface”. Journal of Chemical Physics 137, 231101 (2012). Ariel Fernández Stigliano: “Breakdown of the Debye polarization ansatz at protein-water interfaces”. Journal of Chemical Physics 138, 225103 (2013). Ariel Fernández: “Supramolecular evolution of protein organization”. Annual Reviews of Genetics, in press (2015). Ariel Fernández: “The principle of minimal episteric distortion of the water matrix and its steering role in protein folding”. Journal of Chemical Physics 139, 085101 (2013). Ariel Fernández: “Water promotes the sealing of nanoscale packing defects in folding proteins”. Journal of Physics: Condensed Matter – Fast Track Communications 26, 202101 (2014). Ariel Fernández: “Communication: Chemical functionality of interfacial water enveloping nanoscale structural defects in proteins”. Journal of Chemical Physics 140, 221102 (2014). Ariel Fernández: “Packing defects functionalize soluble proteins” FEBS Letters 589, 967-973 (2015). Featured in Journal Cover. Ariel Fernández: “Structural Defects in Proteins May Function as Catalysts, Study Reveals”, Press Release: Discovery of the Catalytic Dehydron, WebWire, July 6, 2014. Ariel Fernández: “Protein Structural Defects Are Enablers and Stimulators of Enzyme Catalysis”. PR Newswire, July 14, 2014. Reproduced in: Yahoo News, The Wall Street Journal – MarketWatch. Posted in Ab-Initio Protein Folding, Argentina, Argentine Science, Ariel Fernandez, Ariel Fernandez book, Ariel Fernandez CV, Ariel Fernandez Stigliano, Biological Interfaces, Biological Water, Biomolecular Interfaces, Biophysics, Buenos Aires, CONICET, Dehydrons, Interactome Complexity, Interfacial Tension, Pharmaceutics, Protein Associations, Protein folding problem, Science, Science publishing.Tagged Ariel Fernandez, Ariel Fernandez Argentina, Ariel Fernandez Biophysics, Ariel Fernandez Biotechnology, Ariel Fernandez book, Ariel Fernandez CV, Ariel Fernandez Stigliano, Biomolecular Interfaces, biotechnology, Richard L. Moss.